Hello Everyone, I am really happy that this blog (Galaxy Y Nation) helped a lot of people. Thank you so much for making this blog a successful one. You guys are really awesome! Here i want to present our new blog "Tech & Online Stuff". Here is a short and sweet description of the new blog- On the blog i share all my knowledge and useful and informative things i know about the Tech and Online world. Some of the topic on which you will find article are- Blogging, How-to guides, tricks and tips, SEO, Making money online, online jobs. Please note, these are just SOME of the topics, The blog has just started, but there is going to be lot more and more cool stuff which will make it worth reading. If you do not find the topics of your interest right now, then please just DON't cross the tab, bookmark the site and visit it frequently, I am sure the blog will be of your use in future. 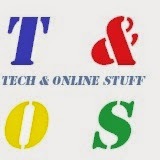 Please Follow "Tech & Online Stuff", Like it on Facebook (You can find the Facebook like box on the Tech and Online Stuff) Share about it to make that blog a success too. It was never possible without the support of you people and can never be. So it is a request to all my dear friends to join me on my new blog too. Thank you so much. You guys are awesome as usual.